Place the flour, butter, sugar, salt and zest in the bowl of a food processor. Process in short bursts until mixture resembles fine breadcrumbs. While the motor is running, add the egg yolks and water. Process just until the dough comes together. Turn dough into a lightly floured surface and gently bring together to form a ball. Using your hands, flatten into a disk, wrap in plastic wrap and refrigerate for 1 hour. Roll dough between two sheets of lightly floured baking paper – if dough gets too soft, refrigerate for 5 minutes. Line a lightly buttered 22cm loose-bottomed tart pan with the pastry. Trim edges with a knife and prick the base with a fork. Freeze for 30 minutes. Preheat the oven to 180°C/350°F. Line the pastry with a piece of buttered foil and fill with baking weights/dried beans. Bake for 15 minutes, carefully remove the weights/beans and the foil, then bake for another 10 minutes or until the pastry is light golden. Make the filling: place the butter and sugar in the bowl of an electric mixer and beat until light and creamy. Gradually add the egg and egg yolk and beat until smooth. Stir through the almond meal and flour until well combined. Spoon mixture into pastry case and smooth the top. Sprinkle with the almonds and bake for 30-35 minutes or until the filling has puffed and turned golden. Allow to cool in the pan. this looks lovely..and the ingredients seems simple too..i have very little experience in making tarts..well, looking at this somehow motivate me to start baking some tarts. Thanks for sharing this. So very pretty! Makes me want a slice and a dainty cup of coffee. i love frangipane tarts! and lemon goes so well with almonds! yum! I could not resist that beautiful treat. Awesome tart - beautiful setting! I'm right with you. I usually find lemon-flavored desserts not intense and sour enough. Still, this looks like it'd be lovely with a cup of tea. and great blog too...! we are your newest followers! now i want to buy a pan like that just so i can make lemon tart. im a huge fan of anything lemony myself ;) great photo! Hey, I'm lov'n all the lemon recipes, so I'm going to selfishly say-Have it! Lena, thank you! I wasn't much of a tart baker myself, but now I love making them. LimeCake, frangipane goes really well with strawberries, too! :D Thank you! Helene, I wish I could share it with you! Thank you! Xiaolu, Alice Medrich's lemon lime bars were very sour, just the way I like it! I bet you would love them, too! Cleare, thank you! I have got to use it more often. Karen, thank you! I agree with you - they are so versatile and go really well in both savory and sweet recipes. Hi Patricia. I have just discovered your blog via Hungry Girl Por Vida (one of my favourites) and I am enjoying looking through it. 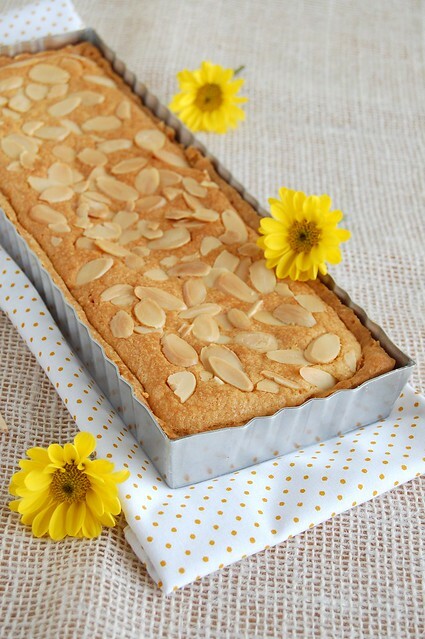 This caught my eye as I love frangipane and wanted to see if this was similar to my version. A little tip for you, which is what I do - spread a layer of lemon curd (homemade or from a jar) over the base, as you do with your Dan Lepard Apple and Berry almond tart. This might give you the lemon hit you are after! It seems strange to me just putting the lemon flavour in the pastry, as I too am a lemon freak! I have also done with this grapefruit marmalade, and I am sure it would work with lime marmalade too, and lemon marmalade, if there is such a thing (I expect so, but I have not ever bought it). I absolutely love the idea of spreading lemon curd on the tart base - delicious! The lemon in the pastry actually works quite well, I just think it needed more zest.